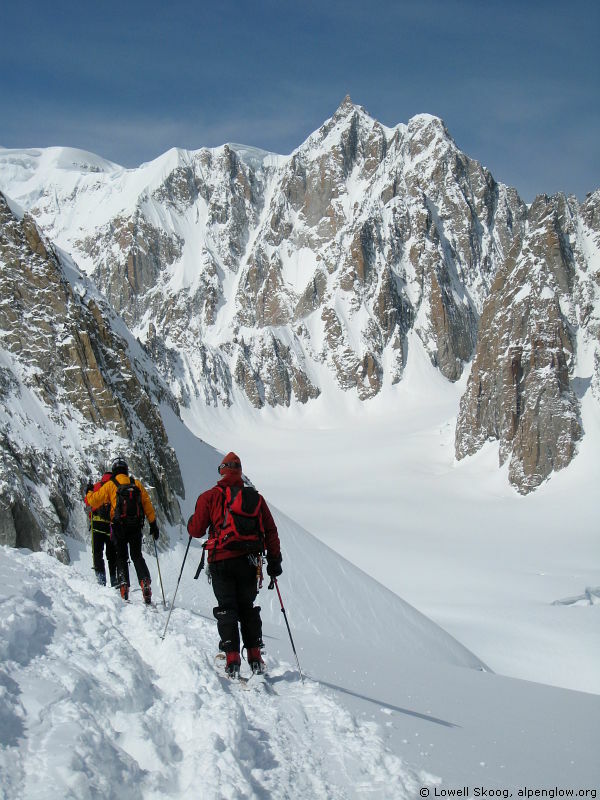 Michael Trommsdorff follows his brother Christian and Paul Russell down the Vallee Blanche in France. 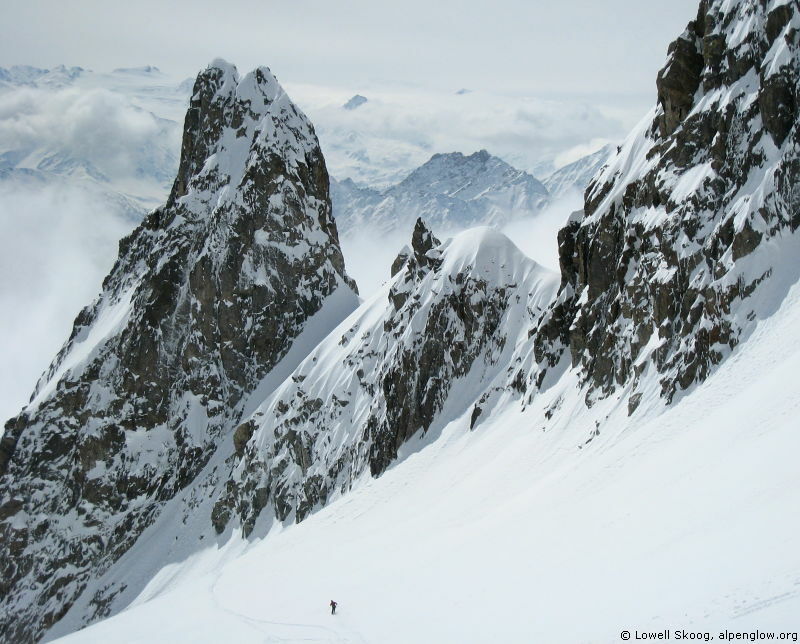 By Saturday, April 12, our group which had assembled to ski the Chamonix-Zermatt Haute Route had begun to disperse.� Unsettled weather had foiled our high route plans, but during the preceding week we had enjoyed skiing in the Trient area, on Gran Paradiso, and on various slopes near Chamonix and Courmayeur.� Corinne and Peter returned to their homes in Zurich and Grenoble.� Bruno and Daniel departed for Paris.� Pierre and Elena were making their way back to New York.� David was off to Spain.� And Greg traveled with relatives in France. 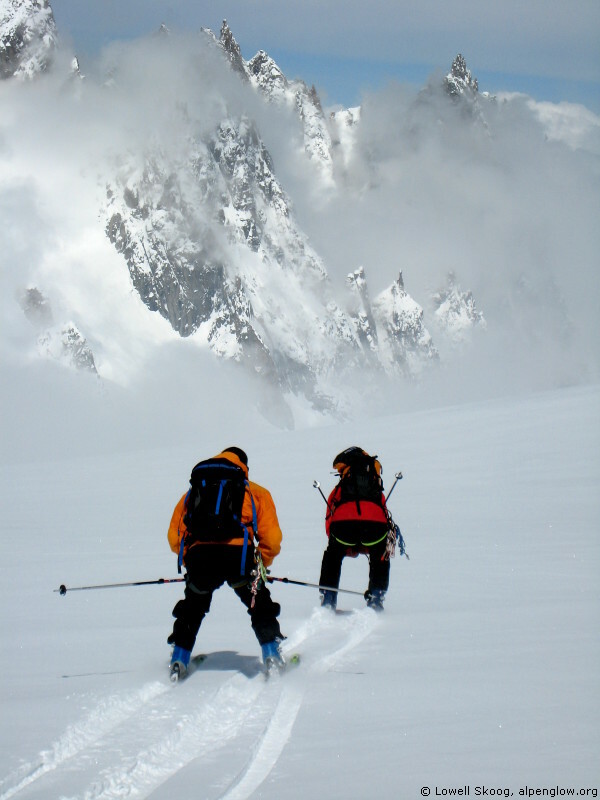 A meter of new snow had been deposited in places by the latest storm, so we avoided the steep couloirs and skied the regular route down the Glacier de Toule.� This glacier and the lifts below Pointe Helbronner provide spectacular views of the Peuterey Ridge and Brenva Face of Mont Blanc.� We were glad for our super-fat rental skis as we enjoyed deep snow during two runs down the glacier. 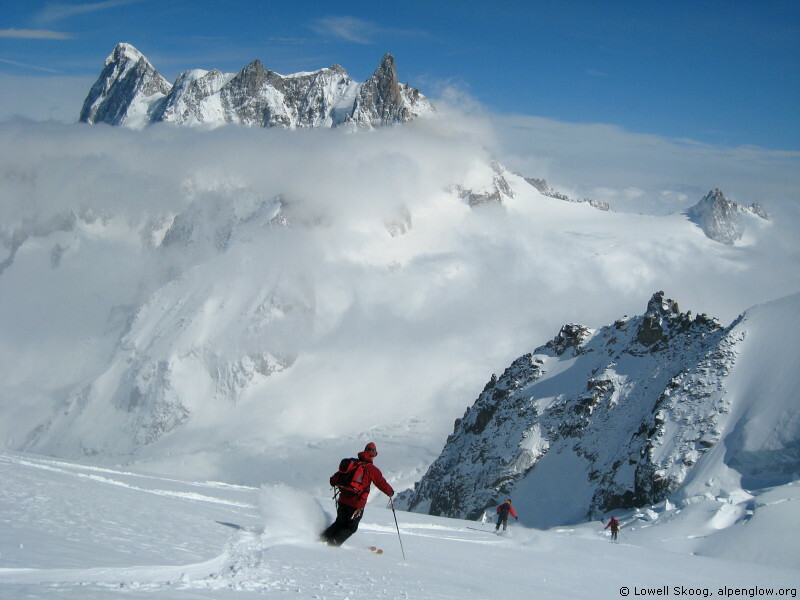 By the time we reached the top for the third time, fog was beginning to obscure the Italian side and the snow was getting heavier.� We descended the French side of the range instead, skiing perfect powder down the Glacier du Geant past La Noire to the flat expanse of the Mer de Glace.� We glided to the foot of the glacier then grunted up the iron trail toward the Montenvers railway carrying our heavy skis. Skiing the Glacier de Toule, Italy. 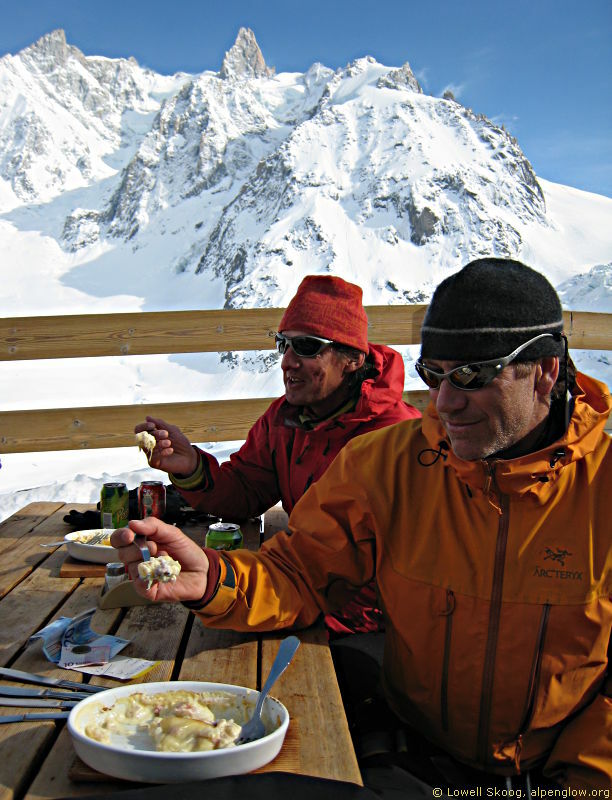 Years of experience in the Alps enable Michael and Christian Trommsdorff to accomplish more skiing in a day than I would have thought possible.� When our train reached Chamonix, a friend of Christian was waiting with a car to whisk us to the Aiguille du Midi lift.� At 3 p.m. we loaded the teleferique and were off again toward the heights. 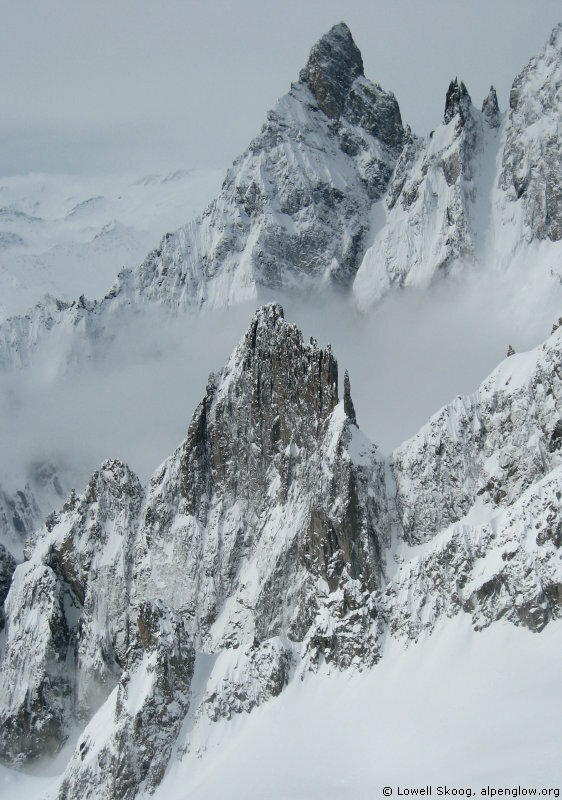 We paused briefly at the summit of the Aiguille du Midi for pictures, then began descending the classic Vallee Blanche run on the opposite side of the glacier from our earlier descent of La Noire.� Again we found excellent powder snow and we enjoyed views of the Grandes Jorasses and the Aiguille du Geant. 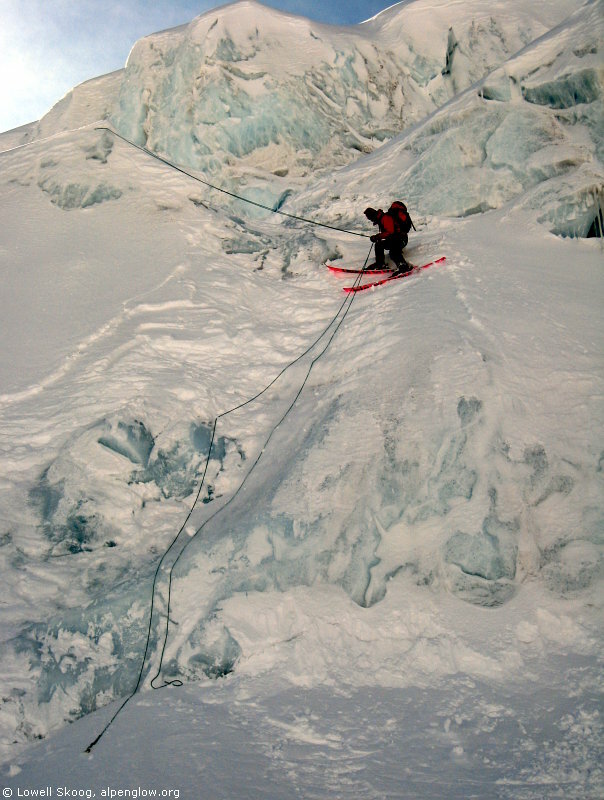 Near the Petit Rognon we encountered an unexpected serac barrier.� Christian placed an ice screw and lowered us individually on the rope.� It was fun scraping down the ice backwards on our fat skis, trying to resist to the urge to grab the rope, which would invariably provoke a shout from Christian.� After lowering the rest of us, Christian draped the rope over an ice pinnacle and descended carefully without leaving any gear behind. We stopped at the Requin Hut for a little rest and refreshment.� Since they didn't offer sandwiches, we ordered tartiflette, a favorite local dish of hot cheese, potatoes and ham.� With afternoon shadows lengthening, we continued down the Mer de Glace to its lowest snout.� The Montenvers train was closed for the day, so we skied and walked down the winter route to the Chamonix valley.� Paul and I returned our rental gear just minutes before the shop closed for the evening.� We walked around Chamonix in our stockings until Michael returned with the car, having hitch-hiked through the Mont Blanc tunnel back to Italy. 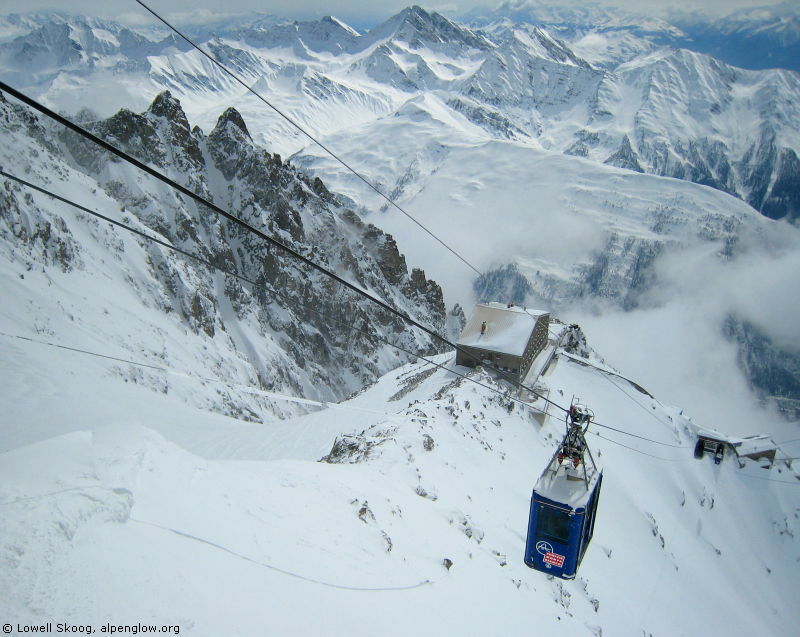 Resembling a can of SPAM, the final lift climbs from Courmayeur toward Pointe Helbronner, Italy. Great pictures, Lowell! I guess I was walking around the farmer's market with my in-laws that day . . . next time, ask Christian to take you to the Cesso Couloir - it's right under the "can of Spam" down and to the right, out of your picture. wow, nice photos, Lowell! looks like you guys are having a great time. 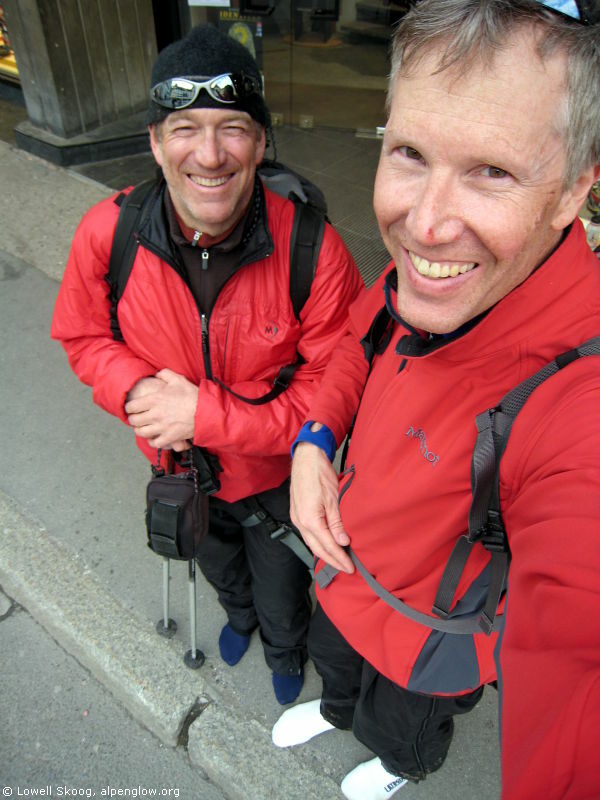 Seeing you and Paul in socks reminded me of my tour of the Haute Route when I wore the lightest sandals available to minimize weight along the route. Great photos. Holy Cow! Looks like you skied about 50 miles that day! Done the 'ol Valley Blanche once and wished I would have made the tour over to C. Italy, too. Think in one of those photos I can just make out the top part of the Grand Pilier D'Angle near the Peutery? Oh I must get back there (not to ski the G. P. D'angle...no way, no way....) that area is So COOL. I hear the Three Cols" tour some where over by Argentier and Aiguill du Chardanee (bad spelling ...sorry) is pretty cool too (especially when Haute Route is weathered out...). As usual Mr. Skoog, total style and class. Thanks for sharing it. 1) Being asked if I'll need a rope for dropping into the exposed steeps as we get on the last telepherique, then reminded not to fall� (yikes, what am I doing).� And why is everyone wearing a harness and carrying axes? 2) Being asked if I realized I had set off a slide and skied into it on the last run (now know I have no idea what I'm doing).� Isn't this ski area patrolled? A very memorable day indeed !! This was definitely the best run on the vallee noire I have ever had! Paul - love your list - that's really funny . Would have expected you to add the faces of the guys at the rental store when you returned your mud covered boots. Thanks for the great TR Lowell. Paul - love your list - that's really funny� . Would have expected you to add the faces of the guys at the rental store when you returned your mud covered boots. I remember the shop tech's words the most: "Thank you for returning the boots all muddy. Thank you very much!" Then he inspected the bases of my skis very carefully. We slunk away. Great pictures Michael! You should note in the first one (with the Black Crows skis) that I'm practicing how to say "DUDE!"